Wow, my students made a great Indian meal tonight! 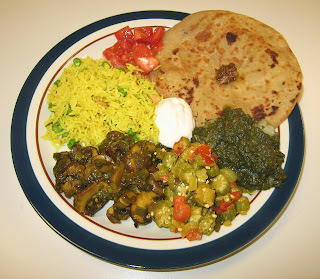 Everything came out very well, including the pilaf and various vegetables. We had a side of soy yogurt and I purchased a choice of Malaysian style lentil-filled parathas (breads) or potato-filled parathas. This was their best night of cooking yet! I had a very nice Father's Day yesterday, ending with my wife treating all of us to a South Indian meal at Sitar Indian Restaurant near our home in Durham, NC. 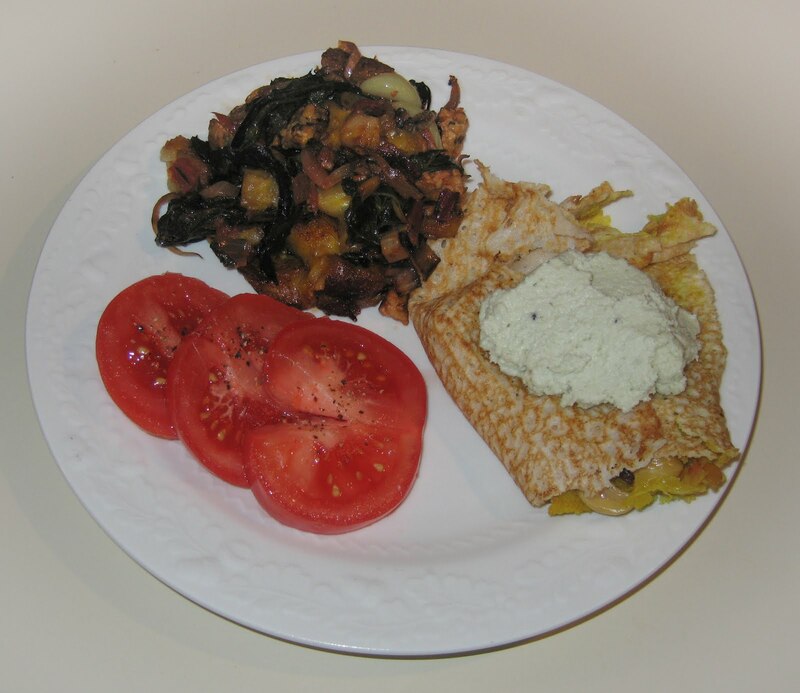 Half of my dosa (one of my favorite foods - an Indian crepe filled with spices and vegetables) was a leftover, which we had today, along with some greens and plantains. We went to an outdoor film tonight, and I made a filling dinner before we went out. 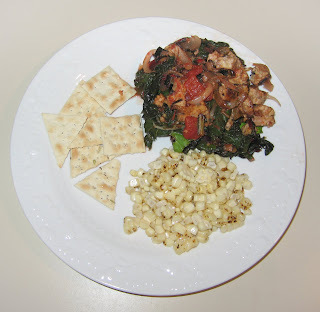 I cooked some kale and chard with tempeh, adding salsa shortly before serving. 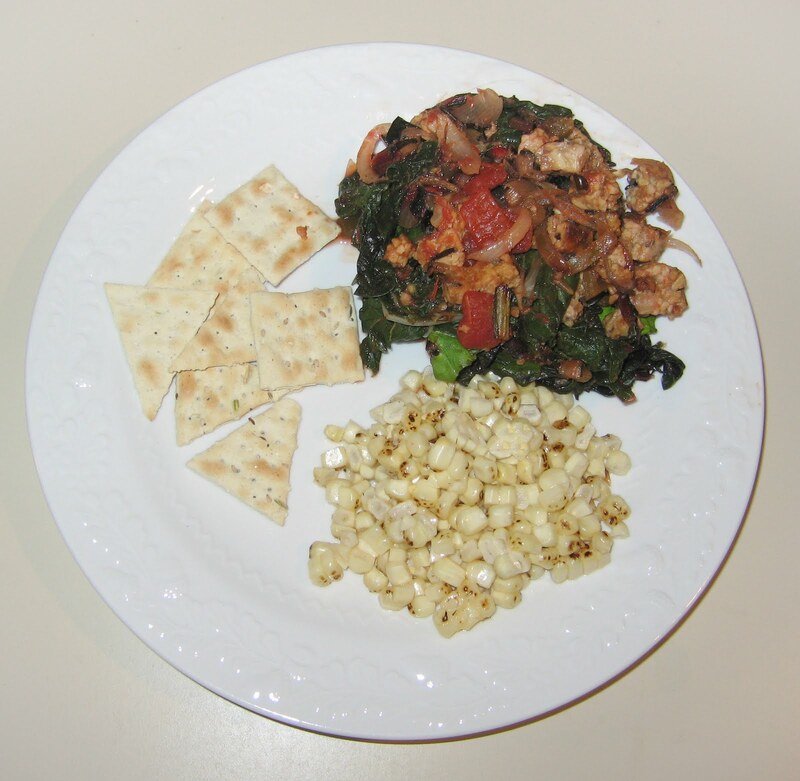 I also made some corn off the cob and served some crackers. My wife enjoyed a Mother's night out and I went to an American Dance Festival performance; for about an hour and a half when we were both out, my parents watched our daughter. 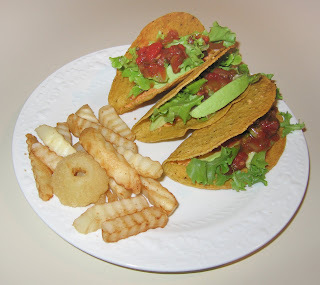 I ate late when I got home and made a simple taco dinner with French Fries and onion rings. 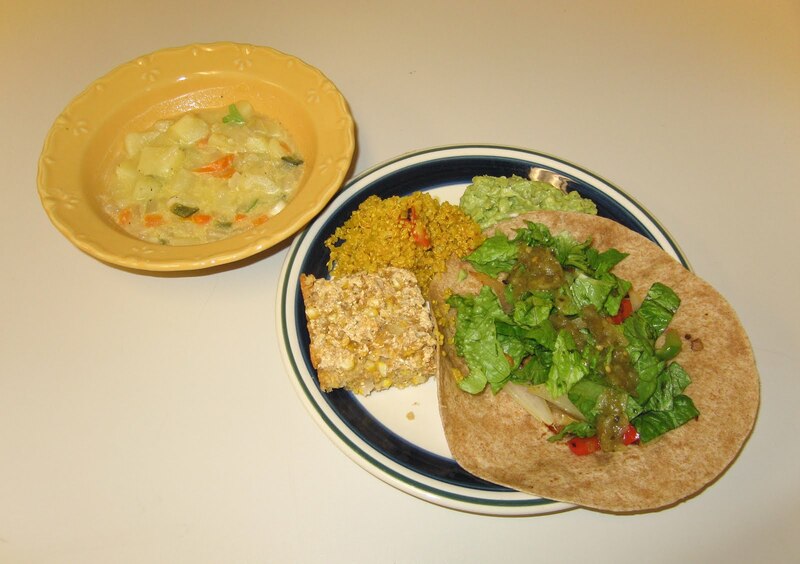 My students made a delicious vegan Mexican-inspired dinner, including seitan-based fajitas, cornbread with fresh corn, quinoa with leeks, guacamole, potato soup, and (not shown here) an orange rice pudding. 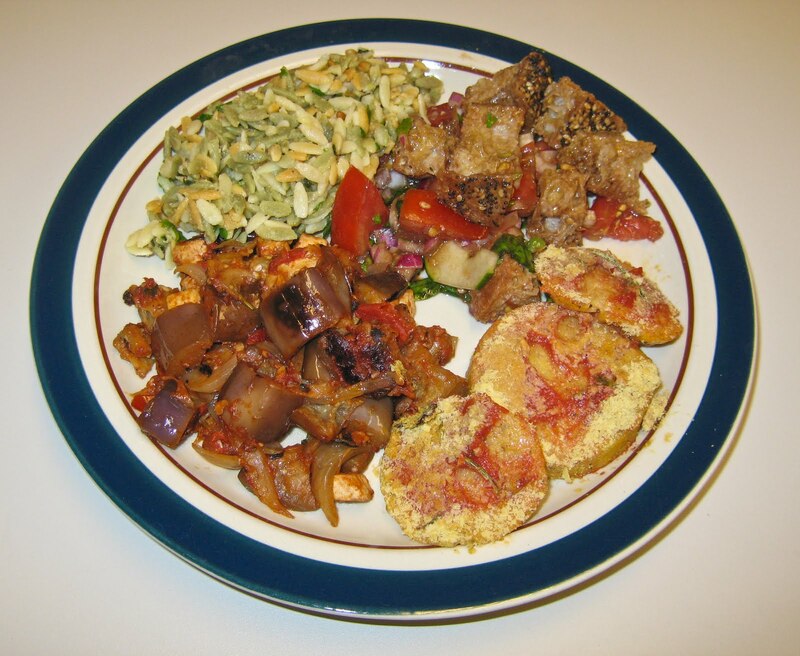 This plate of one of my students' reflects the tasty Italian meal that they made today. 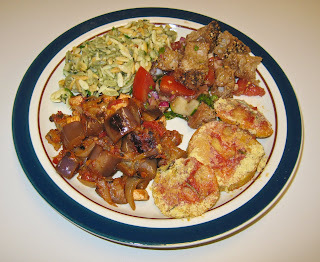 Dishes included an eggplant saute, baked polenta, orzo, and one of the best dishes we make in class, a terrific panzanella, or bread salad. Like I did last Sunday, I decided to make enchiladas, as I had much of a pack of corn tortillas waiting to be eaten. A few days ago, my wife purchased some cauliflower and complained that I don't often cook with it - I didn't realize she particularly liked cauliflower! So, though I know she doesn't like Mexican meals, I thought I would make a cauliflower enchilada. I preheated the oven to 375°F oven and started baking two small potatoes, wrapped loosely in parchment paper. I also cut most of a head of cauliflower into florets and cut those florets into quarters, then got the cut cauliflower cooking in boiling water. I put a little bit of olive oil in a flat pan and briefly, for a few seconds each side, cooked each of six tortillas so each was softened a little. In the same pan, I then briefly sauteed for just a minute or two half a small Vidalia onion, chopped into maybe 1/4" cubes, and about a quarter red bell pepper, also chopped into small cubes. In the last few moments before I turned the heat off, I tossed in a few pinches of cumin seeds and stirred. Once the cauliflower was soft, after maybe 10 minutes, I drained it and mixed it together with the onion and bell pepper, as well as a pinch or two of salt and maybe 1/2 teaspoon rosemary needles, roughly cut into halves or so. I laid out this mixture in the middle of each tortilla; on half of them, I also sprinkled a little bit of Daiya vegan cheese (cheddar). I rolled each tortilla and put a toothpick through it to keep it together. I put the "cheese" tortillas on the bottom of a casserole dish, covered the filled tortillas with the remaining half of the 16 ounce can of enchilada sauce I had from last week, then put the three tortillas on top, and covered them with the last of the sauce. I covered the casserole dish and baked in the oven for about 20 minutes, till the top-most parts of the top layer tortillas were getting a little crispy. I served it with some seitan strips. Avocado and baked potato rounded out the meal. 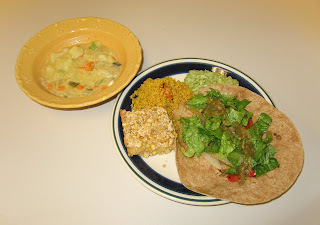 I had a new 6-week session of vegan cooking classes start today. 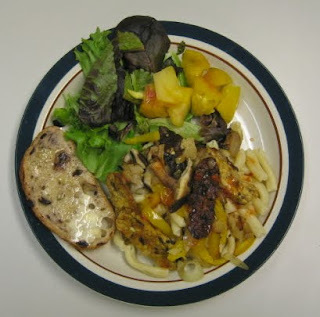 My students made a tempeh saute and served it over pasta. It's always fun teaching this class - students seem to really enjoy making yummy dishes!